This article is about the character. For the voice actor, see Al Gore. Albert Arnold "Al" Gore, Jr. was the Vice President of the United States serving next to Bill Clinton during the end of 20th century, and leader of the secret Vice Presidential Action Rangers. In the 31st century, he has become a head in a jar, the first Emperor of the Moon and the inventor of the environment. Al Gore was leader of the Vice Presidential Action Rangers . Other members included Stephen Hawking, Nichelle Nichols, Gary Gygax, and Deep Blue. It was their duty to protect the fabric of the universe against destructions. Since there is a space-time nexus at the point where Fry is frozen, Fry not getting frozen could start a reaction that could destroy the universe. Thus, in a What-If scenario, Al Gore and his Action Rangers ensured that Fry is indeed frozen and sent to the future. Fry, however, not wanting to go to the future (after having seen "monsters" in a Fry-hole), destroyed the freezer tube, and the universe disappeared shortly thereafter. 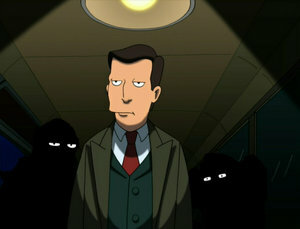 Al Gore won the presidential election of the year 2000, however Bender entered the vote-counting room and blew up the basket with Gore's thousands of votes in it, making George W. Bush the winner of the election. Later on in the century as a part of his campaign to protect Earth from global warming he opened his own Hybraxi service (Hybrid taxis). One of his customers was Bender who paid him $100 to catch Fry in another taxi, however Bender made Gore crash the Hybraxi. 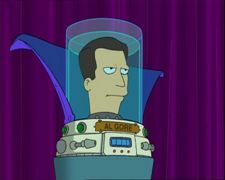 Al Gore survives in the 31st century as a head in a jar. He is emperor of the moon (and claims to have ridden the mighty moon worm), and has written at least two books (Harry Potter and the Balance of Earth). As a prominent environmentalist, he is asked to speak at a symposium, which is meant to solve the problem of global warming. There his jar displays the ability to fly under Gore's control, an ability only a handful of other heads in jars (such as Stephen Hawking) possess. Gore later appears in the fleet that seeks to defeat the fleet of solid gold Death Stars, the Scammer's are using to maintain their rule of Earth. Gore uniquely, did not use a ship and demonstrated his jar is armed with twin laser cannons and is capable of combat level maneuvering. After the initial commander; Zapp Brannigan, was removed from the battle within the first 10 seconds, Gore along with the other commanders, agreed to obey Leela's commands. Shortly after Hermes Conrad took control via direct interface with the battle-grid, turning the tide. During this rally for the Earthican forces, Gore distinguished himself well, by destroying a Death Star single handedly, by flying to into and critically damaging the 'Achilles Vent' and escaping moments before the Death Star detonated. Al Gore has written a sequel to his 1992 book Earth in the Balance entitled Harry Potter and the Balance of Earth, which was much more popular. In the 31st century, Al Gore is on the $500 bill, in place of William McKinley. In The Beast with a Billion Backs, Al Gore's head and body can be seen at the Deathball match. Al Gore: The universe would be destroyed! And as an environmentalist, I'm against that. Al Gore: I have ridden the mighty moon worm! Al Gore: Finally, I get to save the Earth with deadly lasers instead of deadly slide shows. Farnsworth: Good news! All these pine trees are fighting global warming by producing oxygen. Happy now, Gore? Al Gore: Yeah. But I'd be happier if I had a set of lungs. Al Gore: Damn, that hundred dollars could've bought me... one gallon of gas. This page was last edited on 12 July 2015, at 21:39.